I have long been curious about Ozone Park, especially in the region around Cross Bay Boulevard north of the Belt Parkway. 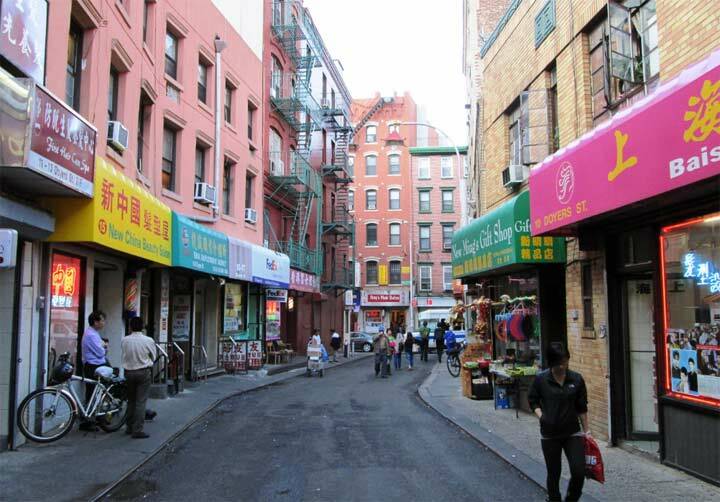 It was easily reachable for me via bicycle from Bay Ridge starting in the 1970s and continuing in to the 1990s when I moved to Flushing. And, one thing I noticed on my trips there: Hagstrom and Geographia Maps, the main sourcing for people entering the neighborhood and wanted to know how to get around, dropped the ball embarrassingly in this neighborhood. Strangely the neighborhood was largely still developing in the 1970s, with 133rd Avenue built across the erratic street grid between 81st Street and the A train. 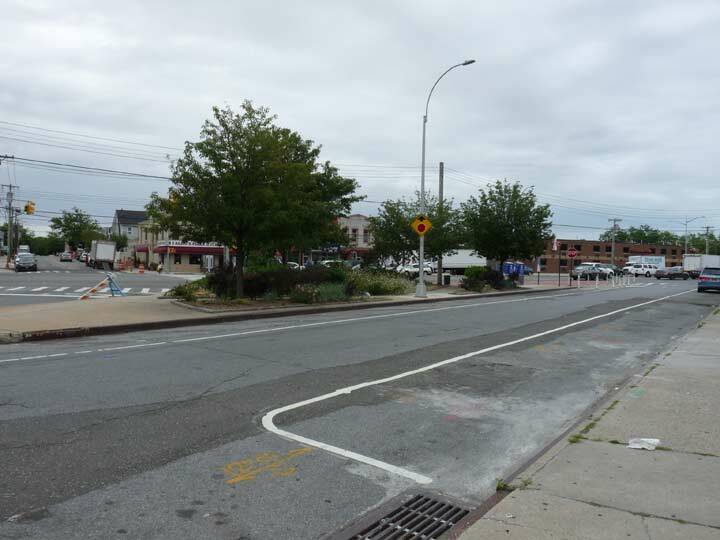 Meanwhile, decades ago, there must have been an effort to do the same thing with Linden Boulevard and the work actually got started, but was abandoned early on, leaving stubs. There are a variety of small streets like Doxsey Place and Jaegers Lane that are not shown on most paper maps (and in some cases even modern Google maps). 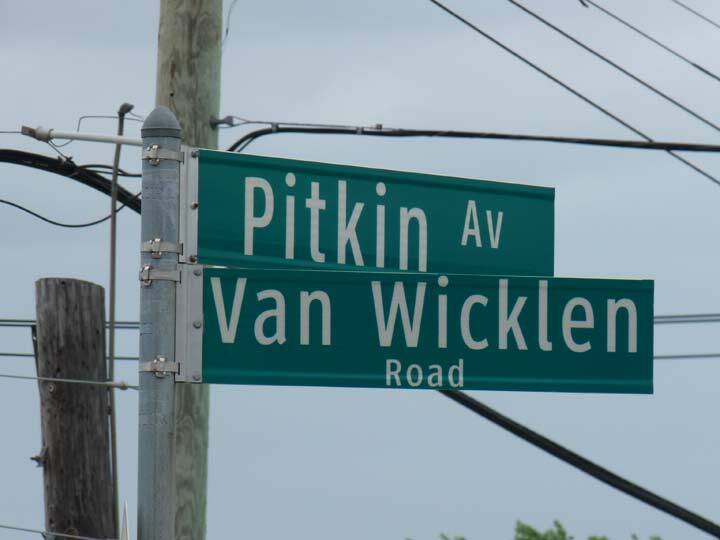 And there’s this short street, Van Wicklen Road, which branches off Pitkin Avenue at Redding Street and runs a few feet southeast to Cross Bay Boulevard. A closed craft store and a mattress store actually front on it, but both have Cross Bay Boulevard addresses. Hagstrom always ignored it. Like many street names, it references the reality of over a century ago. This is an excerpt of a 1909 map of the area, and nothing on that map is really the same today. Old South Road is still there but most of it is now called Pitkin Avenue or Albert Road. The wide street snaking southwest on the map was later widened and straightened to create Cross Bay Boulevard. The railroad on the right is now the A train, and Centreville Street is still there. That’s about it. The Van Wicklen family had a large holding in the area. In a couple of decades, they would sell it, it would be divided into lots, and a rough street grid would be laid out. 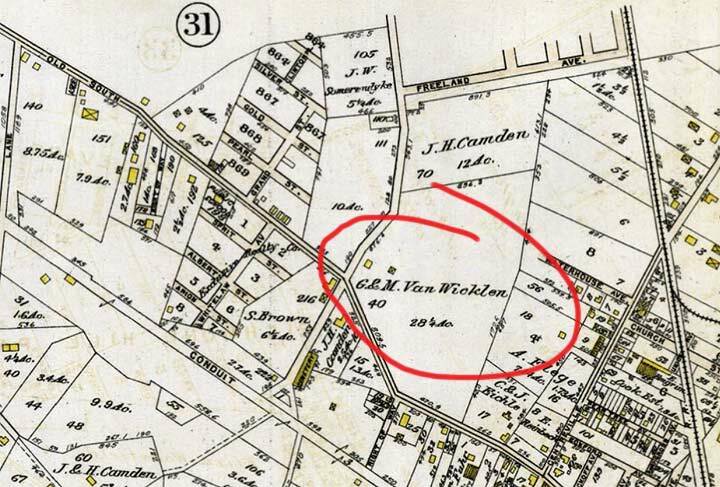 Someone in an office many years ago thought they would honor the Van Wicklens, though not the Camdens and the Browns, who also owned large plots here, with a very short patch of asphalt.